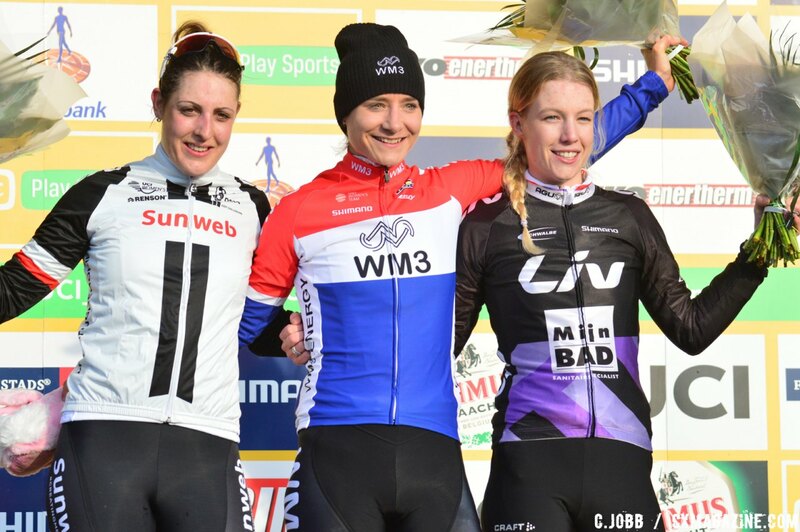 Sunday’s Telenet UCI World Cup race in Hoogerheide, Netherlands was the final tune-up before next Saturday’s World Championship in Bieles, Luxembourg. With all the top women taking the start line, the race was an opportunity for racers to make a statement heading into next Sunday’s big race. After a two-year absence from the top step of the Worlds podium, Marianne Vos’s (WM3 Pro Cycling) statement was pretty clear: The Champ is Back. 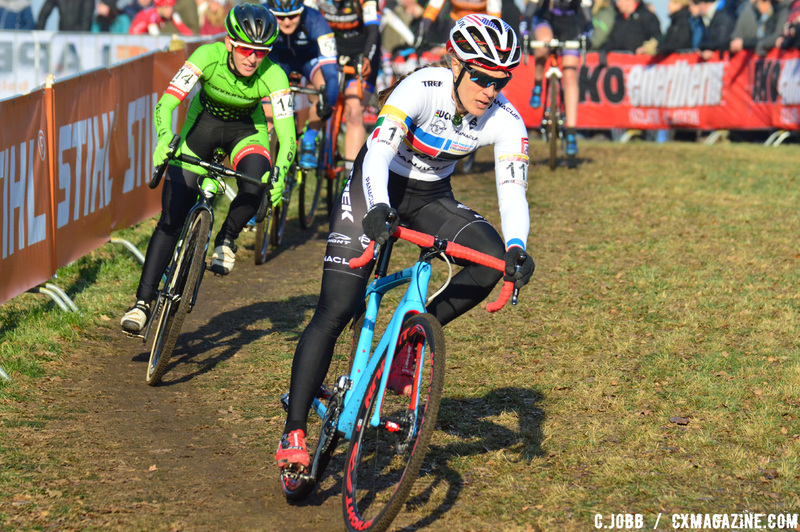 The seven-time world champion’s performance at Hoogerheide has to be downright scary for other riders with dreams of the rainbow stripes, as she rode a flawless race highlighted by multiple displays of her overwhelming power. Vos single-handedly put in two big attacks to break up large groups of riders that were a common sight on the hard, icy Hoogerheide course that rode like a grass criterium. The second of these attacks was a blistering offering on the penultimate lap that left her competitors stunned and resigned to competing for second place. 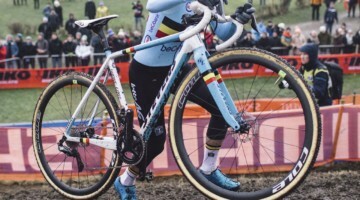 The win is Vos’s third in three World Cup starts and establishes her as the clear favorite to win her eighth cyclocross World Championship next weekend in Luxembourg. The Hoogerheide World Cup, also known as the Grand Prix Adri van der Poel is traditionally the last event of the UCI World Cup. With the exception of World Championships held there in 2009 and 2014, the 2017 event marked the 11th straight year Hoogerheide hosted a World Cup race. The conditions for the European races thus far in the 2016-2017 season have been notable for their decidedly un-real-cyclocross-conditions-like nature. Instead of muddy conditions where racers are forced to race the course as much as their other competitors, many of the races have been held on days where the courses are fast and relatively clear of Mother Nature’s influence. 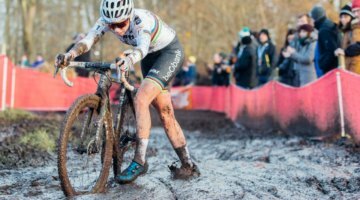 Sunday’s conditions at Hoogerheide were the polar opposite of the sloppy mud race won by Sophie de Boer in 2016. The track was icy and hard and lap times were very fast. The open, relatively flat layout created a race that played out like a grass criterium, with large groups of riders forming throughout the field. With temperatures hovering just above freezing, much of the course was still icy, and there were several corners where a moment of inattention could cause a painful wipe-out for riders. After a strong start to the 2016-2017 season, defending World Champion Thalita de Jong (Lares Waowdeals) has fallen on some hard times during the past month. 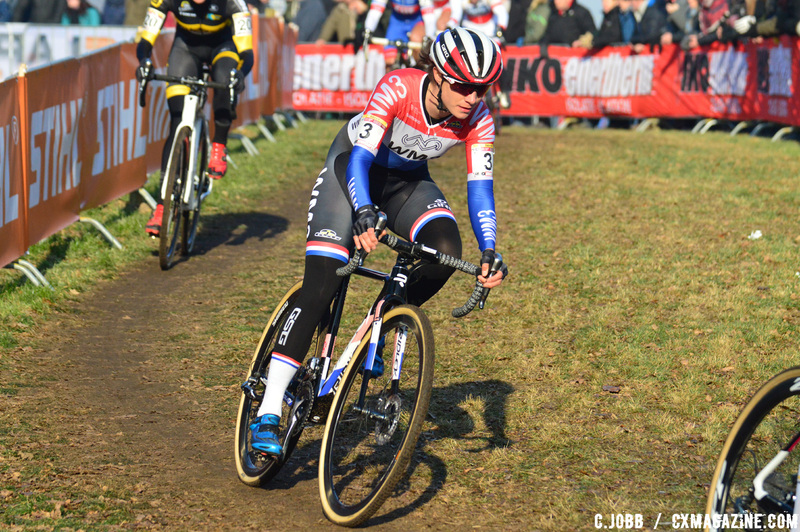 On Sunday, she looked to put a tough fifth place finish at the Dutch National Championships behind her by jumping out to a fast start in her last race wearing the 2016 rainbow stripes. De Jong took the holeshot and led a strung-out peloton of riders out for the first lap of the race. 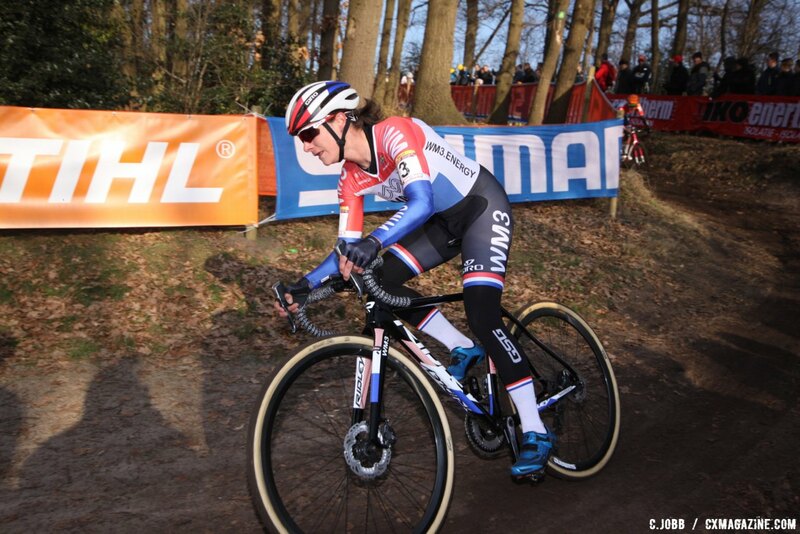 Although not muddy, the course at Hoogerheide still featured several corners that were rendered deceptively-technical by a veneer of ice similar to the one seen last week at Fiuggi. Several top riders saw their podium aspirations slip away when they slid out on the icy corners and crashed down on the frozen ground. The first of these unfortunate crashes happened to De Jong on the first lap. She slipped out on a corner with a small depression and crashed down hard onto her leg. After letting the field pass, she tried getting back on the bike, but was unable to regain the ability to pedal after the hard fall. After a few corners, she exited the race and went to the hospital to have her injured leg examined. On Twitter, De Jong said she will be getting an MRI on her injured knee on Monday. At the end of the first lap, 12 riders sat in a lead group with another large chase group close behind them. The icy conditions meant another rider’s mistake could spell doom for the top riders, so there was an impetus to put in some work despite the fast open conditions on the course. Clearly feeling fine after five straight wins, Marianne Vos decided the start of the second lap was as good as any to put in an early-race attack. Although Vos’s solo time off the front was short lived, it did serve its purpose by breaking apart the gaggle of riders at the front. When the Vos attack played out, Katerina Nash (Team Clif Bar), Lucinda Brand (Team Sunweb), and Sanne Cant (IKO Enertherm-Beobank) joined her in a lead group of four, while Katie Compton (KFC Racing p/b Panache) and Eva Lechner (Team Clif Bar) dangled close behind. It is fair to say Katie Compton had a rough afternoon in her first race since winning her 13th straight U.S. National Championship in Hartford, CT. She was swallowed up at the start of the race despite a prime first-row start position, and had to work extra hard to make her way back to get within striking distance of the lead. After nearly closing the gap to the lead group midway through the race, a small bike issue and a slow trip through the pits cost her several precious seconds in her chase for the lead. Still, heading into the fourth of six laps, she was riding at the head of a chase of eight just five seconds off the lead group. Shortly into the fourth lap, the worst of her bad luck reared its ugly head. One of the icy corners was a downhill right-hander that forced riders to ride the line between ripping it and washing out. Compton crossed that line and crashed to the ground, effectively ending her shot at the podium. 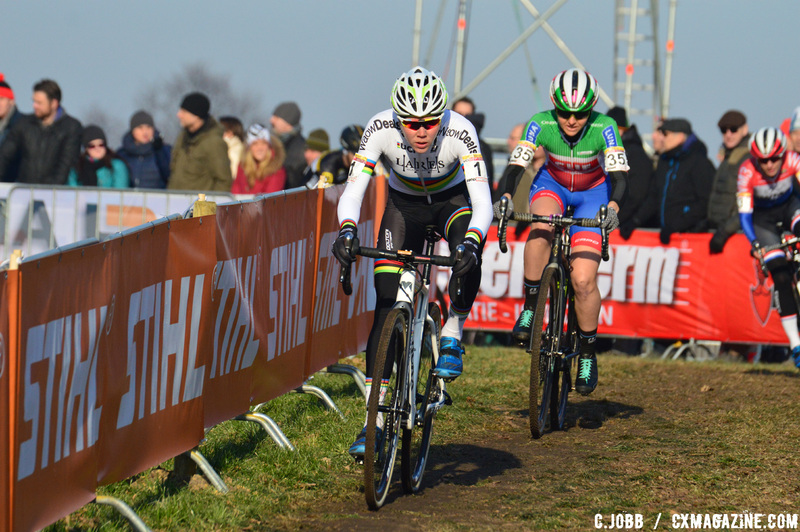 Minutes later, another crash would have a profound effect on the Hoogerheide women’s podium. 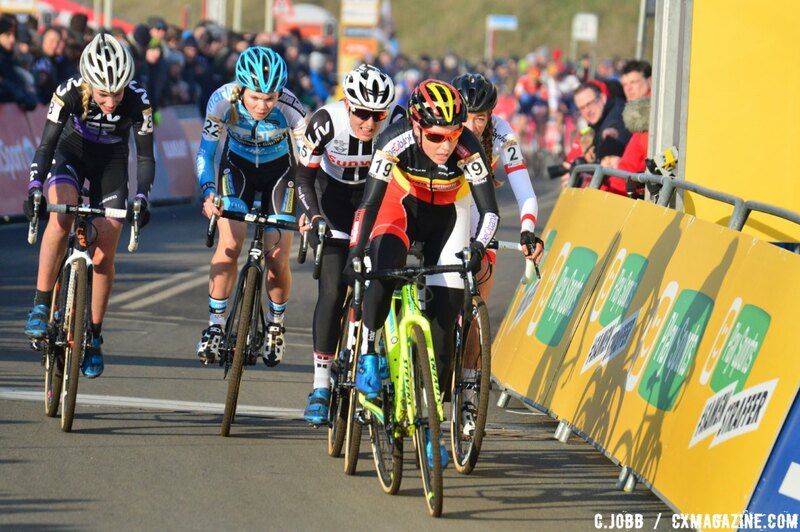 Sanne Cant rode at the front of the lead group, with Lechner, Nash, Vos, and Brand behind her. On an uphill left-hand turn, Lechner washed out and her teammate Nash crashed down on her. Vos and Brand were able to stay upright and escape as the head of the race was significantly reshuffled. Cant sensed the opportunity to attack and put in a hard dig to get away while only Vos was able to initially make contact. Like other attacks thus far in the race, Cant’s effort did not stick, and when the riders entered the penultimate lap, the new front six were Vos, Cant, Brand, De Boer, and U23 rivals Annemarie Worst (Mijn Bad Liv/Giant Offroadteam) and Laura Verdonschot (Marlux-Napoleon Games). 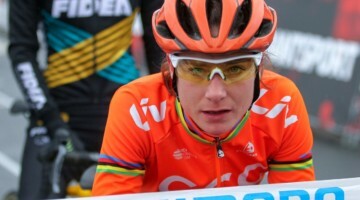 If fans were hoping for a thrilling finish like the one at the Zolder prize fight, Marianne Vos left them sorely disappointed on Sunday. Vos wasted little time during the penultimate lap by putting in a second big attack that turned the heat level up from blistering to raging inferno. The initial effort gave Vos a six-second gap back to Cant and Brand, and when she crossed the line for the bell lap, her lead had swelled to 16 seconds. Vos would not be challenged during the last lap. She completed her nearly-flawless race to win her third World Cup in three tries and establish herself as the overwhelming favorite to pick up her eighth World Championship next weekend in Luxembourg. Writer Bill Simmons of The Ringer has a test he calls the “Eye Test” for watching sports. As an observer, you can look at podiums and jerseys won, but there is value in watching an athlete play their sport and considering the intangibles they bring to their field. Yes, other women riders should be concerned about Vos’s dominating performance in the last two laps at Hoogerheide, but of bigger concern may be how effortless she made those attacks look. Each time she was on the front, her demeanor was calm as she churned out power with a graceful, high cadence. Her smooth efforts were contrasted by her chasers Cant and Brand, whose faces did not belie the toll Vos’s attacks took on them. As Vos raced away at the front, the main attraction again turned to the battle for second. 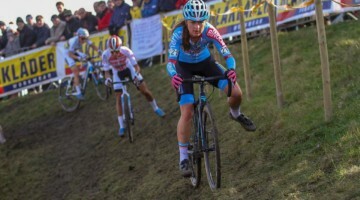 Lucinda Brand has had a breakout first full year of racing cyclocross, highlighted by a second place finish at the Dutch National Championships, but has yet to step onto the podium at a World Cup after fourth place finishes at Valkenburg and Zolder. 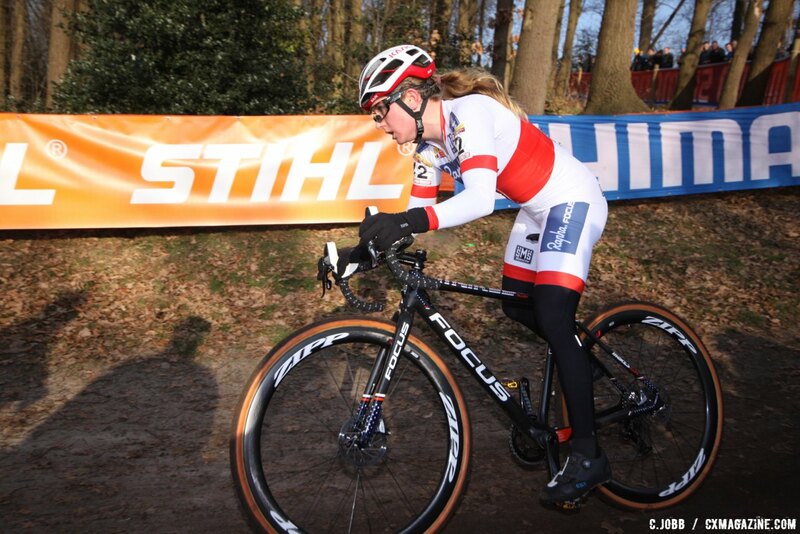 Brand’s podium drought would end on Sunday in Hoogerheide. She took control of the battle for second from Cant with an attack shortly inside the bell lap. She made the attack stick and rode a perfect last lap to take home second and her best finish ever at a World Cup event. Annemarie Worst continued her strong late season surge by overtaking Cant in the last lap to take the third spot on the podium. Worst’s racing age is just 22, and she has raced cyclocross sporadically while focusing on a career in mountain biking and swimming. She finished fourth at Fiuggi and now has to be considered one of the favorites for the Women’s U23 World Championship race next Saturday. Laura Verdonschot and Evie Richards also put themselves on the U23 favorites list, finishing fifth and sixth, respectively. Ellen Noble (Aspire Racing) had a tough afternoon, finishing 39th, but she did clinch the overall Women’s U23 World Cup championship ahead of Verdonschot. 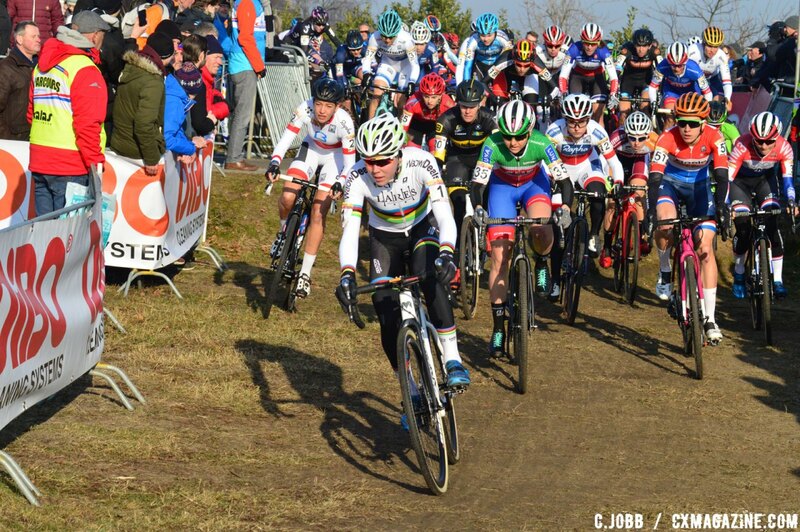 Nearly all of the Team USA Worlds contingent took the start line at Hoogerheide. Kaitlin Antonneau (Cannondale Cyclocrossworld) led the American finishers in 14th, Compton took 17th, Amanda Miller (Boulder Cycle-Sport/Yogaglo) finished 19th, Rebecca Fahringer (Amy D Foundation) got 24th, Courtenay McFadden (Zones American Classic) finished 37th, and Noble took 39th. Other notable results include a 20th place for Helen Wyman (Kona Factory Team) in her first World Cup after a lengthy absence due to injury, 18th for Maghalie Rochette (Team Clif Bar), and 31st for Caroline Mani. Scroll down past the results table for the full photo gallery. Whole day was great racing!